I have scored the work for normal chamber orchestra (excluding clarinets), but the form of this concerto is not traditional, as there is no slow movement, or, more precisely, it does not occur in the traditional place. The violas first phrase – a falling minor sixth, followed by a step-wise climb almost to the starting note. A series of upward leaping sixths. An obsession with the ninth, and chords based on the tonic, major seventh and ninth. The orchestra deals with this material rather harshly, before handing it over to the soloist, who, with long phrases and a lyrical response to the ideas, takes control, never really gets cross, and can show off a little in the cadenza which, as I hate most cadenzas, is brief and lightly accompanied. The movement ends wistfully, with a hint of the first idea presented by two solo violins. To follow the tranquil, lyrical coda of this first movement with a tranquil and lyrical slow movement seemed a poor solution. Instead I have attempted a set of variations encapsulated within several recurring rondo themes which bind the movement together. The Theme is a perky twelve bar idea presented by the soloist, though not in its purist form, and the falling third (cuckoo call) is clearly heard. Variation 1 is a full orchestral tutti. Variation 2 develops the rhythmic possibilities of the theme and also introduces a pair of recurring “rondo themes” – the first of which is clearly based upon the main theme, the second a more seductive phrase in seven-eight and three-four time. Variation 3 puts the soloists back in the driving seat and plants certain ideas which will be important in the Finale. Variation 4 introduces another recurring theme – another derivative. Variation 5 is scored for woodwind, and one horn, and the soloist, who teases them with his cuckoo calls. The Finale, Variation 9. The recurring themes are further developed, and the soloist brings a new tune out of the hat, before reminding us of his original statement, and the horns briefly restate two bars from the first movement. This concerto was commissioned by the Beauchamp Sinfonietta, with funds generously provided by Mercia Sound, the Coventry-based independent radio station serving Coventry and Warwickshire, to celebrate the seventieth birthday of one of England’s best-loved instrumentalists, Jack Brymer, to whom the work is dedicated. Jack Brymer was the soloist at the first performance, which took place at the University of Warwick Arts Centre on 9th March 1985, with the Beauchamp Sinfonietta conducted by the composer. In 1998 the composer arranged the last movement of this concerto, Variazione al Rondo, into a work for solo clarinet and wind ensemble: Rondo Variations. Jack Brymer, recently 70, was the star of this enjoyable concert: as well as playing Weber’s Second Clarinet Concerto (the one with the beautiful and surprising slow movement) with his usual rhythmic flair, he unveiled a work specially written for him by the evening’s conductor, Guy Woolfenden. This proved to be an attractively engaging piece: indeed it is some time since I experienced 15 minutes of music so enjoyably filled. In form it has two movements, the second, a set of variations on a sprightly tune, is roughly twice as long as the first and enshrines the slow movement at first sight absent from the scheme. Within this novel framework Woolfenden has produced a string of melodies (one or two perhaps seeming to look back to Richard Strauss), provided his soloist with an enjoyable display and the orchestra with an accomplishment to relish. I liked the way he did not hesitate to open the orchestra up on occasion, though never to endanger the clarinet. Possibly the contrast between the two movements is too marked, and I hope that the variations, which have a distinctly “light” overall feel to them, will not prove a barrier to wider acceptance because the work deserves to succeed. Certainly the soloist seemed pleased with his birthday present and played it quite beautifully: let us hope that he will find other outlets for it. 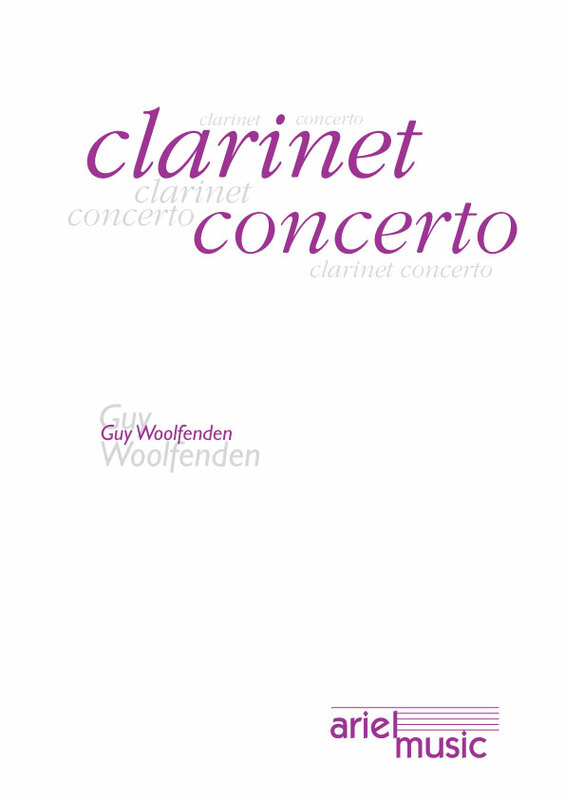 Guy Woolfenden’s Clarinet Concerto, being publicly performed for only the second time, proved to be an endearing, well-constructed piece, full of bustling activity, with fragments of bright counterpoint shuttling to and fro and with some beautiful Elgarian touches. Andrew Roberts, capably partnered by the Liverpool Mozart Orchestra, handled the many fine display passages with skill and confidence. The Alan Paul Concerto and the Concerto by Guy Woolfenden were both written for Jack Brymer. The latter was commissioned to celebrate Jack Brymer’s 70th birthday in 1985. It is unusual in having only two movements, the first a lyrical flowing discourse and the second a theme and variations. Woolfenden’s experience as Head of Music to the Royal Shakespeare Company, and writing well over a hundred scores for the company’s productions, shows in some highly original scoring and subtle rhythmic inflections. The flowing line of the first movement and the wit and insouciance of the second are a fitting tribute to Jack Brymer’s personality and his position in the pantheon of British wind players. Ian Scott is a worthy successor and catches the style of this music with easy grace. Guy Woolfenden is probably best-known as a composer of highly successful and effective incidental music for the RSC. His Clarinet Concerto, in two movements, opens with a moderately fast first movement followed by a theme and variations, which serves as a slow movement and a quick Finale. This very fine piece is another welcome rarity that clearly deserves wider exposure and that definitely whets one’s appetite for more of Woolfenden’s concert works.